WASHINGTON (CNN) -- The U.S. Postal Service is considering ways to save money on mail delivery as Americans send less mail and the service loses more money. Letter carrier Anthony Ow sorts through mail this week in San Francisco, California. "The Postal Service desperately needs to restructure, for its long-term and current financial viability," Phillip Herr of the General Accounting Office told Congress on Thursday. Among the options under consideration are reducing post office hours, closing some post offices, consolidating processing centers and ending Saturday delivery. In an effort to cut costs, the Postal Service has drawn up a list of 681 post offices to study for possible closure. The Postal Service's Jordan Small told Congress on Thursday that most of these are in urban areas so affected customers would not have to go far to find another one near them. 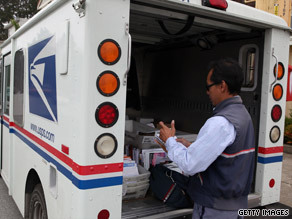 Any post office closures would not affect mail delivery at homes and businesses, he said. But members of the House subcommittee that oversees the Postal Service questioned him closely on what criteria would be used for choosing any post offices for closure and how customers would be affected. Small also recommended an end to Saturday delivery, which some estimates say could save $2 billion to $3 billion a year. Follow a mail carrier on his route to see if people are mailing less today on "The Situation Room With Wolf Blitzer." "Mail-volume levels can no longer sustain six-day-a-week delivery," he said. A recent Gallup Poll reported 66 percent of Americans support cutting mail service to five days a week. The volume of regular mail decreased 5 percent last year, and Herr said it is expected to decline 15 percent in 2009, producing a loss of $7 billion this year. He said even if the economy recovers, the trend would not reverse as Americans increasingly turn to e-mail, online shopping and online bill payments. "The most drastic is probably the first-class mail," said letter carrier Delvin Johnson while on his route in suburban Washington. "I'd say about a third to a half, it's dropped off." But Johnson said he still has to go to every address, even though each stop is bringing in less revenue this year. At one house in the neighborhood, a customer said she would have no problem with ending Saturday delivery. "If they deliver to residences -- not necessarily to businesses, but to residences -- let's say, Monday Wednesday and Friday -- that's more than sufficient," retiree Janet Bachman said. At another stop, a nonprofit group, the top priority was avoiding price increases. "If they were to cut back on delivery days, it wouldn't be as important to us as if they were to raise our rates," said Dave Lesser, who handles mailings at Physicians Committee for Responsible Medicine. "What really is important to us is that we can get our literature out to people at an affordable price." The Postal Service implemented a hiring freeze last year and is trimming its staff by tens of thousands through attrition and early retirement offers. Small said, "We are very proud of the fact that we have never had to lay any employees off." Johnson, the letter carrier, said he was relieved to be working -- even if the length of his assigned route increased this year. "During these times, you know, you have to adjust," he said.